Brothers Deep Field and Shooting To Win (by Northern Meteor) are two of Sydney’s most exciting colts, both with Group One potential according to many. Their dam Listen Here (Elusive Quality) hails from the famous Eight Carat family and carries with her a story that I was lucky enough to witness a glimpse of. A product of Elusive Quality’s first Australian crop, Listen Here was a $150,000 Easter Yearling purchase in 2006 that found her way to David Hayes at Lindsay Park. At the time I was working for Lindsay Park on the stud business (now Cornerstone Stud) in marketing and bloodstock (2006-2012) and was lucky enough at times to wander across to track work in the morning and watch the horses go through their paces. At this point in time, nobody had more of the Elusive Quality breed than Lindsay Park, and the early reports were very encouraging, showing precocity and speed in the initial ‘orientation preparation’ that normally take place in June/July. Therefore, Listen Here commenced her two year-old spring preparation with an air of confidence (unfortunately for Elusive Quality it wouldn’t take long for the theme of the majority of his Aussie stock to develop a reputation for being brilliant at track work, but lacking the constitution to train on). One of the grass tracks on the picturesque Barossa Valley property was a track with a dog-leg to the right with a very steep rise up to the finish. Known affectionately as ‘Collingrove’, this was a great educational track for the young horses, as this steep rise not only was a smart way to keep some of the load off their sometimes fragile front legs, but also taught them to really work to the finish line. Colin Hayes designed this track himself, after travelling the world and observing different training centres such as Newmarket. The Collingrove tracks sits surrounded by agistment paddocks, with a scenic trail from the stables that navigates horse and rider back and forth. The 600m and 800m jump outs were conducted here and anything that could break 12 seconds over the final 200m up the climb was ‘one to follow’. So, along came Listen Here at track work one morning before Christmas, a filly whose third dam it was noted, was the mighty Cotehele House (dam of Commands and Danewin) and thereby a descendant of the all-conquering Eight Carat family (the dam of five Group One winners and the source of many successful stallions and other Group One winners). Listen Here had plenty of competition from her stable mates. However, in her first real test on the Collingrove track, I recall a stunning effort to not only break the 12 second mark, but breaking 11 seconds up the hill for the final 200m. An absolutely blistering gallop, and if my memory serves me correct there might have been a “they just don’t run quicker time than that up the hill” comment from the trainer’s hut. Listen Here thereby went to the races with a big boom in January 2007, but could only manage a third on debut behind subsequent Blue Diamond place getter Shrewd Rhythm. After a freshen up, she was then smartly placed into a Listed fillies race over 1050m on Adelaide Cup Day, the Pewsey Vale Stakes, where she was able to salute and gain that much desired black type. Listen Here ended up racing 14 times for three wins and three placings, with over $111,000 in prize money. In then what was an inspired choice, Listen Here went to Widden Stud and was covered by Northern Meteor in her first two seasons. 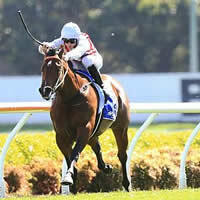 The result – two colts by the names of Deep Field (pictured, a $440,000 yearling) and Shooting To Win ($160,000). The former being one of Australia’s most exciting sprinters and unbeaten after 3 starts with a combined winning margin of 20 lengths, whilst three year-old Shooting To Win was a last start third in the stallion making Group One Golden Rose after missing the kick. Trainer Peter Snowden continues to talk Shooting To Win up as a star of the future, as does Team Hawkes with Deep Field. What a shame that Northern Meteor is no longer here to provide us with more progeny of this most promising union. From a filly who broke the clock on the training track, mated with a colt that broke the clock on the race track, has produced two very exciting colts that look set to continue to make their mark. Everyone has their own thoughts as to what makes a good broodmare, and there will always be exceptions to each rule. For mine, the above traits are extremely valuable and desirable. Another mare that carries these traits, many of them in a much greater way, is Black Caviar. This is why I believe Black Caviar is a much better chance of being successful at stud than some of the other champion mares of past days that haven’t lived up to expectations in the breeding barn (ie. Makybe Diva, Sunline, etc). But I digress, this is not a piece about Black Caviar, it’s about Listen Here! Unfortunately Listen Here’s third foal, a colt by Hinchinbrook was destroyed. She now had a yearling filly by the same stallion, and after missing to Snitzel last season, we keenly await what else is in store from this mare who looks to create her own small branch of Eight Carat gold.